It is a strange time of year to start my blog as we are staring wistfully out at our gardens which now appear in sepia instead of our beloved technicolour. It is, in fact, the time when we are starting to plan next year’s changes, amendments and experiments. I have two gardens which I am developing, my own and the residents’ garden here at the Crescent. 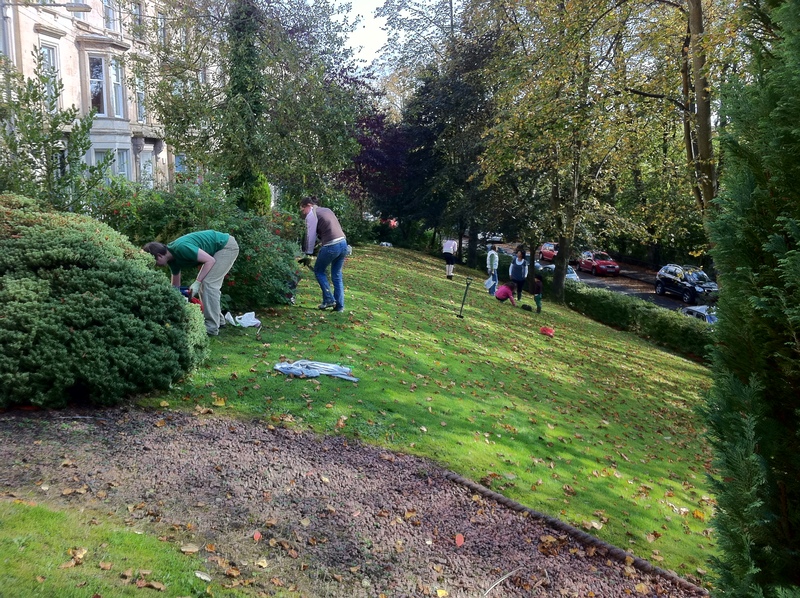 The Crescent’s garden has been ticking over for years without much happening, but now we have a really enthusiastic team of people who are willing to turn out and weed, plant and tidy. We have made an amazing start this year, clearing out dead shrubs and plugging border gaps with colourful hardy perennials such as Persicaria, Astrantias, Geraniums, Nepeta and Bergenia. In the woodland areas we have added Epimediums, Pachysandra, Hellebores and Hedera and in one wonderful day we planted 1000 spring-flowering bulbs. A new Magnolia Soulangeana has been added to the central planting bed, and a Cornus controversa ‘Variegata’ has been planted as a focal shrub in the East end of the garden. Hopefully this will grow to be a magnificent specimen in years to come. In the spring we will be plugging gaps in our hedge with Fagus sylvatica ‘Purpurea’ and sitting back to enjoy the bulbs as they emerge and seeing how our new planting develops. My challenge for next year is working out how to ensure the garden boundaries look good from both outside and in. My own garden is undergoing major surgery. I am capitalising on the disappointment of a fierce winter followed by this summer’s wet weather by abandoning my usual routines and concentrating on preparation for next year. The garage has been painted, new gates built, a new plant ‘holding’ area established, new plants collected and of course a modest but essential greenhouse shoe-horned into the only available space after a nifty repositioning of the back gate. 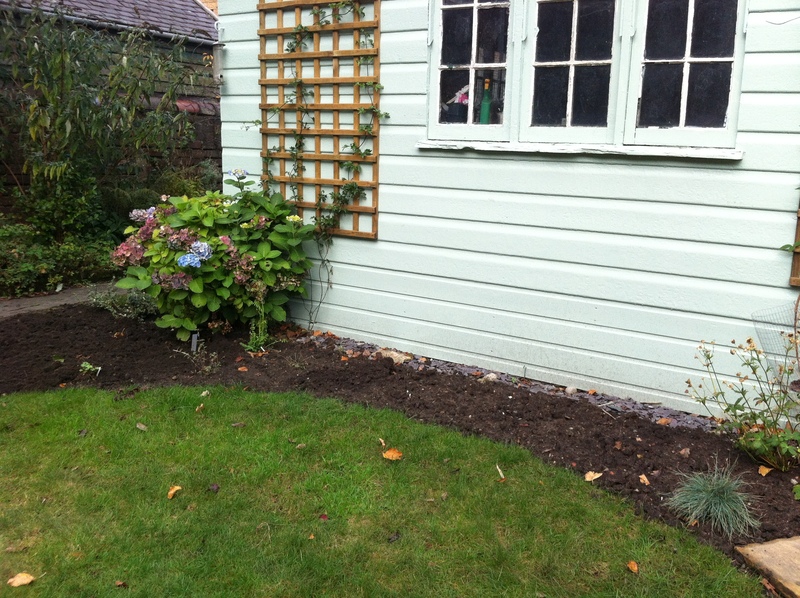 I have finished off by setting-out the new lawn and digging out the new planting beds. can't wait to plant this up! 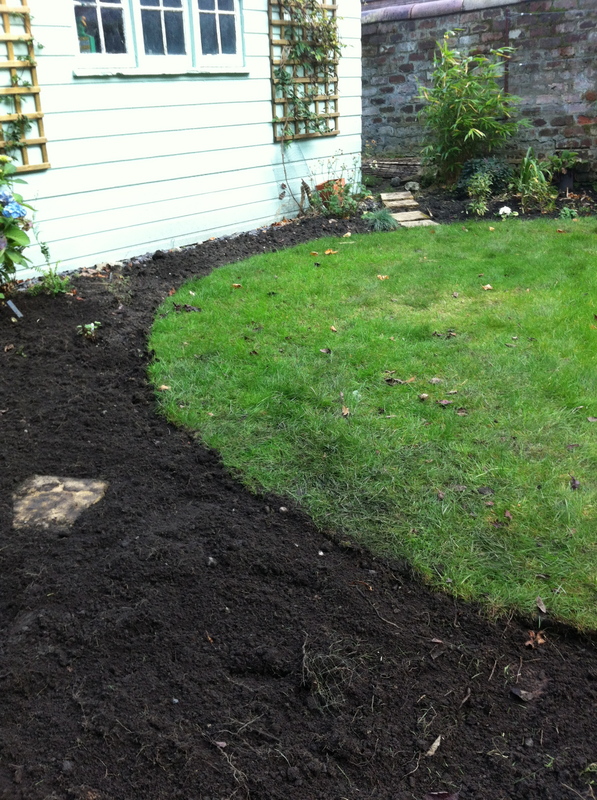 This circular lawn will be surrounded by grasses and perennials to create an enclosed and secluded space with year-round interest, plus I have doubled my planting area allowing me room to experiment with new plants and combinations. The lower half of the lawn will be dug over next year and terraced to increase the planting area even more. I’ll be getting someone else to dig that out this time!! « Bad Wind After Christmas!! !